It’s been awhile since BACK-ON updated their official Myspace, but with 1 day left till the release of their very first full album YES!! !, they have revamped their profile with new banners, and more importantly, provided preview clips of 4 [LA mix] versions of their songs from their brand new album! As for the other songs, it will certainly be interesting to hear what everyone thinks; I heard from the grapevine that apparently the [LA mix] versions should be a little heavier and emphasise the ‘rock’ aspect of each song. Unfortunately Myspace are not doing BACK-ON any favours as they convert the original songs to very low bit/sample rates (96kbps and 22kHz apparently) so the songs sound rather unclear and somewhat hollow to me, but I think the bass and guitars are definitely a lot more pronounced! What are your thoughts? To add icing to the cake, BACK-ON have also updated their profile photos on their website, and you can see thumbnails of their brand new look below, but I would highly recommend clicking on the thumbnails to visit our fan photo gallery for the full size photos! I actually want to do a bit of a fangirl scream here for ALL of the band members (Kya!?) but just to pick out one band member, doesn’t Icchan look so much more mature? 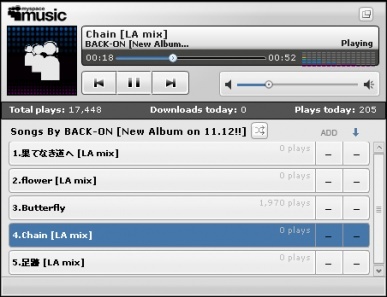 And last but not least, for people who can’t access BACK-ON’s Myspace, fear not, because we have recorded all the 4 [LA mix] song clips into one long mp3 (3:15) that you can download or listen to online below!